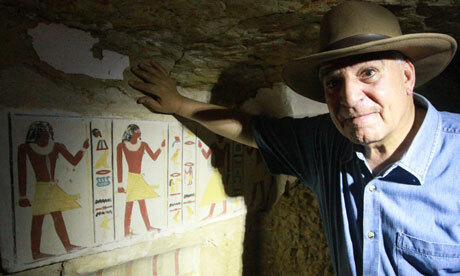 There’s a nice piece by Jack Shenker in the Guardian 19 May that supplements my post on Zahi Hawass. 100 days into the new Egypt, Hawass is portrayed as the ultimate survivor, a guy who can move from a Mubarak cabinet to a post-Mubarak cabinet, overcome a pro-Mubarak speech, ignore the accusations of corruption and arbitrariness that still cling to him, and avoid the consequences of a court judgment against him. “A few months ago I would never have thought he could survive this wave of scandals, his connections with the previous regime, all the claims of corruption that have dogged him for the past nine years,” said an Egyptian archaeologist who preferred to remain anonymous.